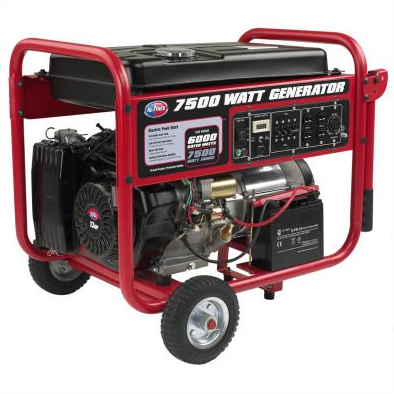 This gas powered All Power America APGG7500 generator is lightweight and portable. It is ideal for camping, tailgating, and for power outages in a house or mobile home or RV. This product is sold for about $800 on Amazon. This generator also has no-flat tires which makes it easy to transport around. It comes with a wheel kit. It can run up to nine hours on half load using 6.6 gallons of fuel. It has an electric or recoil push start for frustrations free use, which is what you want when it is storming and the power is out. The main feature is the ability to run at 6,000 watts continuous and 7,500 watts surge. It comes with a 389cc OHV air cooled engine. Other features include the low noise level at 76db. An additional feature is the hour meter. It comes with a fuel tank size of 6.6 gallons and two a/c duplex 120 volt outlets. This product is recommended for its versatility and portability. It has a maintenance free battery and comes with a handle that you can pull the generator with.